Attila, the leader of the barbarian Huns and called by the Romans "The Scourge of God", sweeps onto the Italian peninsula, defeating all of the armies of Rome, until he and his men reach the gates of the city itself. A photographer named Corrado snaps a picture of Antonietta. When it shows up on the front page of a magazine, she wants to take him to court over it. A police officer meets a girl who is near to falling into the net of shady individuals. To prevent this, he invites her into the police station and tells her a story. A mature countess and a pseudo-specialist have rented a villa by the sea and, avoiding police surveillance, run a clandestine gambling den. A fake magician makes the inhabitants of a village believe that when one spouse betrays the other they will ring the bells. 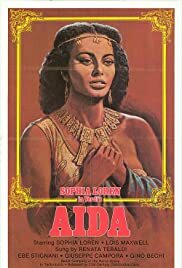 Sophia Loren plays a dual role, as both the sultry Queen of the Nile with a "man-a-night" appetite and a beautiful slave girl who takes her place and is wooed by a bodyguard who thinks she's the real monarch. Story of theatrical troupe that travels through the Old West. An old gentleman, a direct descendant of Zorro, has a single son named Raimundo in whom there is no trace of proud pride. Handsome film production of Verdi's classic Aida succeeds in making grand opera more accessible to the masses. The whole point of making this film, one of the earliest and best international color releases of cinematic opera, was to make it more accessible to the masses. And it succeeded admirably in doing so. The general public would not sit still for a love story about two young exotic lovers in ancient Egypt if played by the typical 300 pound over 40 tenor and soprano with the vocal equipment to sing the glorious music properly. Hence the visual substitution of the beautiful principals (a young Loren, handsome Della Marra, and a slinky Ms. Maxwell)who make the story much more believable, giving those not familiar with the plot or the music a better chance at being wooed into the lovely arias who otherwise might not be. Altogether, an enchanting introduction to one of Verdi's great works. I remember seeing this when I was in junior high school and it certainly awakened my interest in opera, a form with which I was then not well acquainted. I still regard this film fondly and would recommend it highly to those who might appreciate the great music accompanied by better than average visuals. Luciano Della Marra was a standout as Radames, and unfortunately for audiences did not appear in any other films.